The ancient Greek site of Epidaurus has a colossal amphitheatre (see photo). It is noted for its stunning symmetrical design, impressive acoustics, and remarkable condition. The Epidaurus theatre of Greece was built in the 4th century BC. About a thousand years later, it was abandoned, neglected and gradually covered with earth. It lay buried until excavations began in 1881. 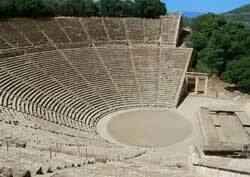 The Epidaurus cultural venue in Peloponnesus, Greece can accommodate 14,000 theatergoers. They are extraordinary. From an upper-row seat, you can hear a soft-voiced actor without aid of an electronic or other artificial amplification device. Today, a world-renowned annual festival takes place in the open-air Epidaurus theatre from mid-June to late-August. It is one of the top theatrical events in Greece. Dramas by Aristophanes, Euripides, Sophocles and other illustrious ancient Greek playwrights are performed. The ruins of Sanctuary of Ascelpius are near the theater. 2500 years ago it was a celebrated healing center in Greece. The infirm traveled great distances in the hope of being healed by the Greek god Ascelpius, son of Apollo. While the theatre is the major draw of Epidaurus today, the Sanctuary was the star during the site's heyday, from the 4th to 2nd century BC.